All-Terrain Vehicles (ATV) are one of the top listed Boy’s gadgets these days, they have been making trend and gaining attention in the Indian Automobile market also. An ATV also known as quad, quad bike is used for some off-road adventure and as the name suggests reaching terrains where a normal vehicle cannot reach. This Friday Nebula Automobile launched some new high-end ATV’s for the Indian market. Nebula automobiles are a leading automobile brand and have a wide variety of ATV’s, Golf carts and agricultural equipment’s. Nebula launched three new high-end ATV’s in the Indian market named Trike, HS800, and AX700. Nebula Trike is a three wheel ATV which is a beauty to look at, a pure piece of art and power. Nebula Trike is equipped with a 300cc water cooled engine which produces 13Kw of power at 6500 rpm. It weights 220kg, tank capacity of 12L and is priced at Rs. 7, 70,000. Next is the HS800 which is an all-terrain vehicle, it is equipped with a 800cc, Water cooled, twin v-type cylinder engine which has a top speed of 70km/h and a tank capacity of 30L. The Nebula HS800 has an option to switch the vehicle between 2WD and 4WD, it has the sitting capacity of 2 people and it priced at Rs 16, 50,000. The third ATV launched is the AX700. The AX700 is a single sitter ATV equipped with a 686cc 4-stroke, liquid cooled engine with both front and rear disc brakes. The Nebula AX700 has the option to switch between 2WD and 4WD and is available for Rs 12, 00,000. The trend for ATV’s is new for the Indian automobile market and still has a long way to cover. They are very few companies for ATV’s in India and ATV motorsport is also gaining attention gradually. ATV’s are not street legal and thus does not require any registration or license for driving. 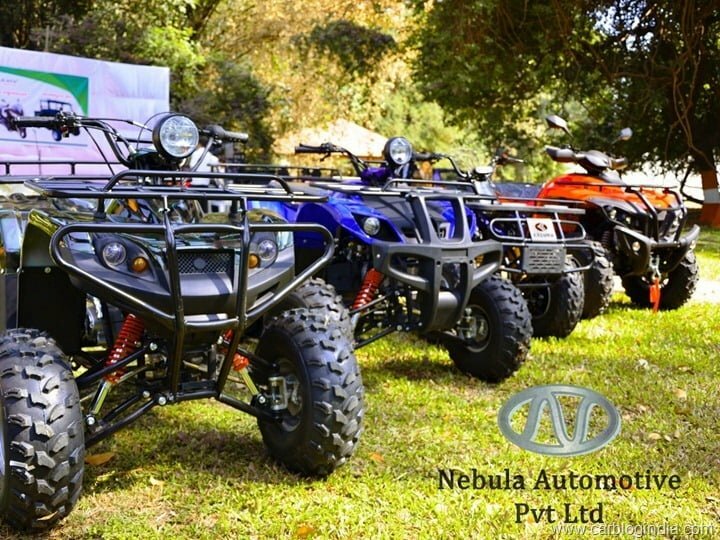 Nebula is the biggest ATV maker in India has their stores in Pune and Navi Mumbai. The price ranges for Nebula ATV are from Rs 90,000 to 2, 30,000.